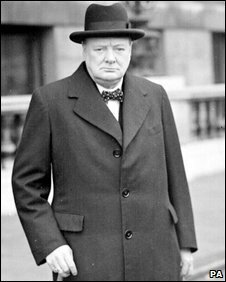 Using Sir Winston Churchill's image in a British National Party election broadcast is "disgusting" and should have been banned, his family has said. 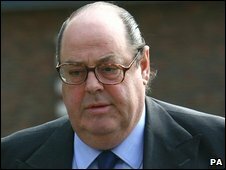 Conservative MP Nicolas Soames, the prime minister's grandson, had asked the elections watchdog to intervene. He said Sir Winston would have been "appalled" by the way the BNP claimed to represent the wartime generation. The BNP said the Churchillian rhetoric, to be broadcast on Tuesday night, was relevant to Britain's situation today. The broadcast will show BNP leader Nick Griffin adopting part of Churchill's famous "blood, toil, tears and sweat" speech and also features archive footage from World War II. Mr Soames, MP for Mid-Sussex, said: "My views are that they have behaved in a disgusting manner. "They should not take my grandfather's name in vain. He would have been appalled by their views and the way they claim to represent the wartime generation. "It's nonsense. Were it possible to take action, we would. We find it offensive and disgusting." BNP deputy chairman Simon Darby said the Churchillian rhetoric used in the broadcast was "very relevant" to what is happening today. He said: "I am extremely upset at what is happening to the country. What was the point of fighting the Second World War if this is where we are going to end up?" In a magazine called The Rune, published in 1995 and edited by Mr Griffin, an article appears to praise the exploits of the SS during WWII. The magazine said: "The tales of Waffen SS courage and sacrifices are almost limitless." "In an unbiased assessment of war crimes, however, the Waffen SS were undoubtedly no worse than the troops of other nations - countless Allied war crimes are simply not publicised." Mr Griffin has also handed out leaflets outside Coventry Cathedral, referring to "mass murder" during the Allied bombing of Dresden. A spokesman for the anti-racist and anti-fascist group Searchlight said Mr Griffin's "hypocrisy" was "sickening". "This is a man who has heaped praise on Hitler's SS and accused RAF pilots of mass murder," he said. "For him to evoke the memory of Churchill and our Second World War servicemen is a disgrace."